Two Thursdays ago, the copy of Pioneers of Mixing at Elite Bars: 1903-1933 was still on the counter, so I began to flip through it again. There, I spotted a Rye Crusta that seemed different than the standard Maraschino, orange liqueur, lemon juice, and bitters combination. 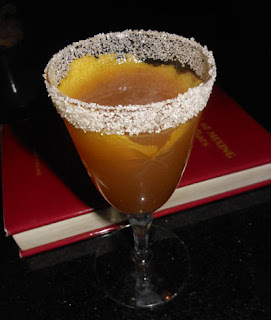 While this one did have the classic sugar-crusted rim, it had a very 19th century way of garnishing with lots of fruit, berries, and herbs and lacked the traditional wide citrus peel; the fruit garnish was something that I also observed in the Whiskey Crusta from Harry Johnson's Bartenders' Manual. Johnson's Crusta was also unique as it called for an orchard syrup which has been interpreted cider boiled down several fold into a sweet syrup. In the end, I added the standard citrus peel garnish to the Rye Crusta and spared the fruit (which worked in Johnson's because the glass was filled with crushed ice which supported the garnishes). The rye whiskey aroma joined that of the lemon peel garnish's. A lemon and malt sip contained some of the fruitiness from the grenadine; the rest of the rye flavor came through on the swallow along with the orgeat's almond.